At least one voter has been observed voting twice under the watchful eye of a Philadelphia poll worker. We have already heard that Republican Election Board members have been tossed out of polling stations in Philadelphia. At today's RedState/Google Brunch with Fred Thompson, the former Senator and Presidential candidate chatted with and took questions from RedState journalists and other guests. Fred spoke about what a masterstroke it was for McCain to select Governor Sarah Palin as his running mate. He also addressed how silly the elite media are for the attacks on Governor Palin as inexperienced. These attacks simply fail to recognize that as the Governor of the nation's largest state, and her two-term experience as mayor of Wasilla, Alaska. Compare Governor Pallin's executive experience to Obama's complete lack of executive experience. Last year, when he was running for Congress, Democrat Chris Murphy railed against special interest money in Washington. "In 2006," a stern-voiced announcer says, "Chris Murphy preached against special interest money in Washington." The ad then runs a clip of Murphy urging voters to "get lobbyists' money and special interest money out of elections." The announcer returns, saying that "Chris Murphy got to Washington and changed his tune," taking cash "from the same type of special interests he preached against." You can listen to the radio spot here. According to the Hartford Courant, Murphy so far this year has received $347,600 from political action committees, the political arms of corporations, labor unions and politicians. The New Britain Herald reports that Murphy's "total haul from special-interest and lobbyist money is over $450,000." 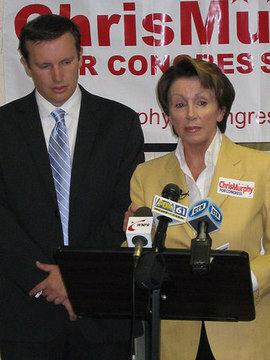 Ken Spain, press secretary for National Republican Congressional Committee, which sponsored the Murhpy spots, said that "whether Chris Murphy is taking money from Washington lobbyists hand over fist or missing a key vote on ethics and lobbying reform, he continues to break the promises he made to Connecticut voters on the campaign trail every day." Spain stressed that Murphy "promised change, but so far, all he has delivered is business-as-usual in Washington. It's time to hold him to account." Murphy's latest inexcusable excuse for missing the vote is that he had “no idea how I missed the vote" on the lobbying reform legislation. There is hope that Murphy's promise breaking hypocrisy can be brought to an end. Republican State Senator David Cappiello is challenging the Democrat of hypocrisy in the 2008 Congressional election. Jim Himes, Greenwich Democratic Town Committee chairman, has raised $352,500 for his effort to unseat New England's last remaining Republican congressman, Christopher Shays. Congressman Shays raised $194,000 for his reelection during the first quarter and will release his second quarter fundraising totals later this week. The election is 17 months away, but with the Democratic Congressional Campaign Committee targeting Shays again, the race for Connecticut's 4th Congressional District should be another squeaker. Tennessee Senator and Republican majority leader Bill Frist, will not be running for president in 2008. My dad in his later years wanted to impart some wisdom to his grandchildren and great grandchildren he would never meet. One thing he wrote that has stuck with me- in fact been a clarion call to me - was “there is so much good to do in the world and so many ways to do it. Politics is a noble occupation. Medicine is a noble profession. Service to others underlies both. The people of Tennessee elected me twice to the U. S. Senate, and I was humbled and honored by their support and every day I did my best to serve them with integrity and common sense. Twelve years ago, I pledged to the people of Tennessee that I would serve two terms in the Senate – to serve as a true citizen legislator – and then return home. I said I’d come to the Senate with 20 years experience in healing, spend 12 years serving in Washington, then go right back to Tennessee to live where I grew up. I’ve never deviated from that commitment. And I will do just that. In the Bible, God tells us for everything there is a season, and for me, for now, this season of being an elected official has come to a close. I do not intend to run for president in 2008. With Frist's decision not to run, there remain 25 potential 2008 presidential candidates. Chris Murphy hasn't even been sworn in as Connecticut's new 5th Congressional District Representative and already Republicans are lining up to challenge him in 2008. The possible Republican challengers to Murphy include: state Senator David Cappiello, just elected without opposition to a fifth term; state Senator Andrew Roraback, just re-elected by a comfortable margin to a fourth term; state Senator-elect Sam Caligiuri, a former Waterbury mayor; New Britain Mayor Tim Stewart; and Danbury Mayor Mark Boughton, who served two terms as a state representative, before being elected Danbury mayor in 2001.